– altitudes in mobile devices is disaster. It’s hard fight where always win in accured measuring and used methods, anyway there is still something you may do. Locus since this version introduce complete Altitude manager that serve single purpose – improve measured altitude. – when you now zoom in/out with Online or Vector maps, Locus now reuses already loaded map tiles and prepare rescaled background for next level. The result of this is much more use friendly experience during zoom like you already know from web map browsers. – we improved existing vector maps to next level. Now, mainly on multi-core devices, maps are around 20% faster, mainly at high level. Low level are still little bit slow, but we see it from more optimistic side – there is still something to improve. – We’re glad to announce a new amazing maps from Russia Retromap. 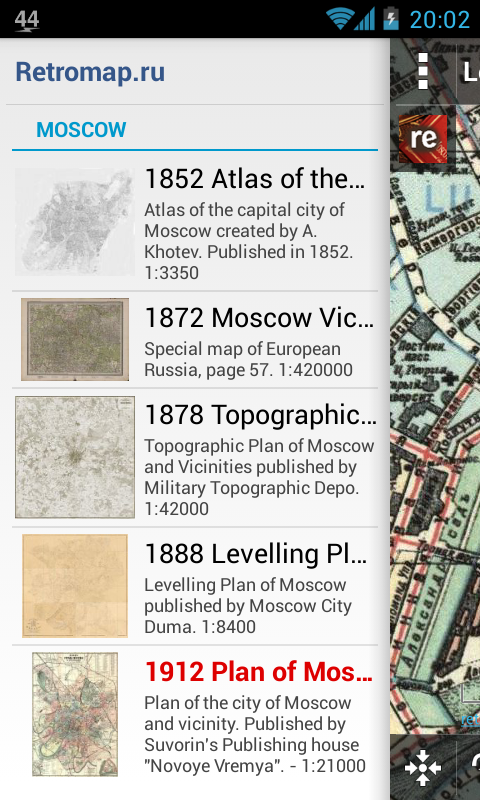 These maps offer huge range of scanned old historic maps, mainly from an area around Moscow. Currently Locus offers just five of these maps, but if there will be interest, owners are able to offer up to 200 various maps. We suggest to check them, just to see how amazing are old “paper” handmade maps. – and these was just news. There is a lot of small changes, many many fixes and more. Need help to translate into swedish? thank you for your offer. Sure, we will be glad for your help with translate to swedish! The new version wil mlName longer run on. my sytem. System: surftab breeze 7 from trekstor. Reason: too small capacity in working intermediate memory. Prg works ok in Acer B1. In case of trouble with a new version, please contact us via e-mail support.locus@asamm.com with more information about the problem.